A few weeks ago Backpacking Light.com asked me to choose three favourite items of gear for the annual Staff Picks article. This has just been published. It’s not a subscription article so anyone can read it here. I chose a new favourite, an old favourite and a recent favourite. The Caldera Ti-Tri stove system is the new favourite, an improvement on the already excellent Caldera Cone that can be used as a wood stove as well as with alcohol and solid fuel. The old favourite was the Jack Wolfskin Gecko microfleece, which has been on most trips year round for the last eight years. I haven’t found a better simple and light fleece top. The recent favourite is the Inov8 Terroc. I’ve used these ultralight and comfortable trail shoes on two TGO Challenges as well as many shorter trips. Of course I have many favourite items of gear and after choosing three for Backpacking Light I thought I’d briefly list some others here. First must come the Hilleberg Akto tent, which I’ve used for hundreds of nights over the last 14 years. I think it’s still the best solo tent for wet and windy weather – but then I can pitch it in a few minutes and I know just how it will perform. The Therm-A-Rest Prolite 3 Short has been my first choice in mats for many years but I must admit that it is likely to lose that place to the new Therm-A-Rest Neo Air Regular Mat which is more comfortable yet weighs less. A review of the Neo Air along with other new items shown at the Friedrichshafen trade show will appear in the February TGO. For sleeping bags I am torn between the Rab Quantum series – I’ve used the 200 on several TGO Challenges and the 600 on two ski tours in Yellowstone – and PHD Minim and Minimus bags. They are all excellent. When not using the Caldera Ti-Tri I like butane/propane stoves and my favourite here is the Primus Micron Ti for three season solo use. In below freezing temperatures the Coleman Fyrestorm Ti is my choice when solo, the Primus Eta Power for two or more. With packs the ones I turn to most are the GoLite Pinnacle for loads under 15 kilos and the ULA Catalyst for heavier loads. And I still have a soft spot for my old heavy load monster, the massive Dana Designs Astralplane. If I was carrying 30kgs plus again I’d still use this pack. (It’s still available from Mystery Ranch under the name G7000). With clothes Paramo waterproofs are favourites outside of summer and I also like the Montane Litespeed windproof, Montane Terra Pants, Teko merino wool socks, Smartwool and Icebreaker merino wool tops, my old GoLite Coal Polarguard jacket and three down jackets - Rab Neutrino Endurance, Western Mountaineering Flight, PHD Minimus. Pacer Poles have been my favourite trekking poles since I first tried them and I really like the carbon fibre ones. I also use the 2-section ones for ski touring. 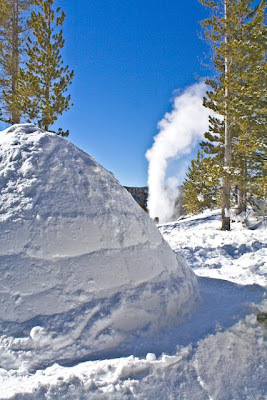 My ski tours in Yellowstone have made Igloo Ed’s brilliant IceBox igloo building tool and Ed’s Wilderness Systems Expeditions Sleds favourites for snow travel. With photography I’ve been delighted with my third and so far best DSLR, the Canon 450D, and with Canon’s two Image Stabilisation lenses, the 18-55 and 55-250, which really do make hand holding at low speeds practical. I’m also very pleased with the Sigma DP1, the only compact that takes images comparable with a DSLR. My review of the DP1 will appear on Backpacking Light next month along with a series of photo essays. Photo info: The Caldera Ti-Tri in use on a cold damp December morning in Glen Tromie in the Scottish Highlands (see post for Dec 15). Canon EOS 450D, Canon EF-S 18-55mm IS@18mm, f5.6@1/20, ISO 800, raw file converted to JPEG in Lightroom 2. Having recently written about cold, wet backpacking and spent time last week replying to comments on my Backpacking Light.com feature on that subject I suppose it was only appropriate that my latest backpacking trip should be one of the wettest of the year. It was only a short trip, an overnight with Cameron McNeish through the Gaick Pass in the western Cairngorms, but it rained steadily almost the whole time. Combined with much thawing snow this made for a trip with wetness at its heart. (Cameron has written about our trip on his site and you can read his account here). For much of the way we plodded through several inches of wet, sloppy snow that deadened our footfall and gave no spring for the next stride, making for surprisingly hard going. The snow did give a little lightness to the otherwise dour day however. The sky was overcast with dark grey featureless clouds shrouding the summits and there was little colour anywhere. An occasional grouse crashed out of the heather at rare intervals, large herds of deer drifted across the hillsides, standing out on snow patches but hard to see against darker vegetation. At one point a golden eagle flew across the slopes, its huge wings beating slowly up and down before it caught an air current and glided out of sight. Mostly though nothing moved and it was calm and dull. Usually I walk solo and enjoy being alone but for once I was glad to have a companion and interesting conversation. Gaick Pass lies between very steep-sided hills that crowd in around the narrowing glen whose floor is filled by a chain of three lochs. As we threaded a way through this wild defile past the half-frozen, silent and cold waters we felt we could have been in remote mountains anywhere, even the Himalayas, for the steep slopes rising either side into the clouds might have continued upwards for many thousands of feet to pointed, icy summits instead of the flat heather moorland hills we knew lay not far into the mist. The Gaick Pass is reputedly the most haunted place in Scotland with many stories of the supernatural and it was easy to see why on a shadowy dark day like this but it’s for a natural disaster that it’s remembered by hill goers. In January 1800 four men died here when the bothy they were sleeping in was destroyed by an avalanche, the site marked by a standing stone. Looking up at the hills towering above I was glad the snow was thin and patchy as we passed by. With no danger of avalanches and no sign of the land of faery the biggest risk for us was slipping on an icy patch hidden under the snow or disguised by heather. 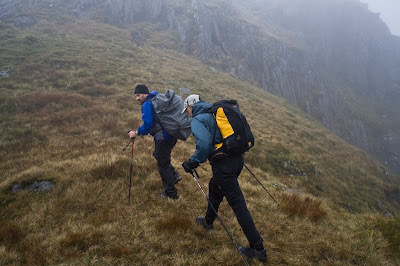 Trekking poles were a great help in keeping our feet. We did see some strange lights as we descended after dark into Glen Tromie. They looked like the brightly lit windows of a house. Cameron, who knows the area better than me, was sure there was no house there. But there was, a brand new big house with lights blazing from every curtainless window. Leaving the snow behind we camped in Glen Tromie near Bhran Cottage, an old barn, a pleasant enough site in such dark December weather with scattered trees round about and the rushing river nor far away. There was no wind, and had been none all day, unusual at any time of year, so the camp was calm and peaceful with just the gentle pattering of the rain on the tents and the occasional hiss of stoves and the bubbling of boiling water. The temperature had been a few degrees above freezing all day but during the evening fell to a few degrees below and the rain turned to sleet and wet snow. In the tent it was dry though, despite the condensation that quickly formed on the flysheet, and it felt wonderful to lie half encased in my warm sleeping bag propped up on one elbow with a hot drink and a good book, relaxing after what had been a tougher day than expected. 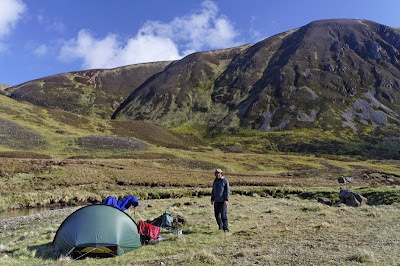 Photo info: Early morning at the Glen Tromie camp. Sigma DP1, f4.5@1/20, ISO 800, raw file converted to JPEG in Lightroom 2. The latest edition of TGO magazine (January 2009, even though it’s early December) includes my review of a selection of camera bags (there’s lots of other good stuff including an excellent piece by Ed Douglas about the ridiculous media storm and the idiotic and disturbing statements by people you might think should know better such as the Cumbria director of public health on the recent Original Mountain Marathon). Unfortunately I could not include my favourite camera bags, which I’ve been using for over 25 years, because they are no longer made. Camera Care Systems (CCS) began making camera bags in the early 1980s and in my opinion nobody has bettered their designs. I’ve lugged their bags many thousands of miles through desert and forest and snow on long walks and they’ve always protected my cameras well. I’ve even had them bounce down a few thousand feet of ice and snow without damaging my cameras. But CCS are no more so for new bags people have to look elsewhere. Writing about camera bags reminded me of a query that comes up regularly on outdoor and photographic forums, which is how to carry a camera when hiking. There are many options, some involving complex tangles of straps and buckles that look far to restrictive and time-consuming to me. I worked out a solution that I find comfortable when I hiked the Pacific Crest Trail many years ago and wanted two SLRs – one for colour film, one for black and white – easily accessible but protected in padded bags. After attaching the bags to my pack hipbelt and shoulder straps in various ways I discovered that it was best to keep them completely separate from the pack. I slung them bandolier style across my body on wide straps so the bags rested below my ribs and found this didn’t restrict movement and actually felt quite comfortable. I’ve carried my SLR cameras like this ever since, though on most trips I only carry one plus a compact as backup. 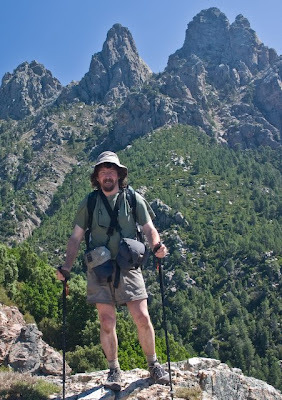 This simple but effective carrying system can be seen in the photo, taken on the GR20 in Corsica a few years ago when I carried two SLRs again – one for digital, one for film this time. The cases are CCS ones but the method works well with other bags. I’ve recently carried LowePro, Zing, Ortlieb, Kata and Crumpler bags like this and found them comfortable. Photo info: On the GR20 in Corsica. Canon EOS 300D, Canon EF-S 18-55 lens @22m, f5.6@1/100, ISO 200, raw file converted to JPEG in Lightroom 2. 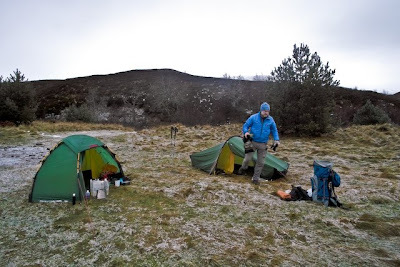 Backpacking Light has just published a feature of mine on Paramo waterproofs. You can find it here but you have to be a member to read it in full. By coincidence I was out today in the Cairngorms trying the new Paramo Velez Adventure Light Smock. The day began calm, clear and sunny though the temperatures remained below zero Celsius. In the last few days fine cold powder snow had fallen and covered everything – heather, rocks, ice, old snow, bogs – which made walking arduous and slow. In places the powder snow was a foot deep but nowhere would it support my weight. Crossing the moor to the east ridge of Cairn Gorm meant plunging through deep snow-covered heather with no idea how far down each step would go and whether my foot would land on springy heather, hard rock or wet bog. Once on the ridge the walking was easier as the bogs and heather had gone and it was just the variable depth of the snow that was challenging. Across Strath Nethy Bynack More was shining in the sun. But out to the west a thin dark line of cloud was slowly advancing. By the time I reached the summit of Cairn Gorm the cloud was thickening and the sun had vanished. The wind was strengthening too and it was bitterly cold. I was wearing a fleece top under my Paramo jacket and had the hood up over my fleece hood and was just warm enough while walking. The descent was even trickier than the ascent as I came down a steeper slope and there was much ice under the snow so I was constantly slipping and skidding and hanging onto my trekking poles. I finished the walk under heavy threatening dark clouds that shrouded the summits. The weather forecast warned of heavy snowfall overnight as I drove home. For once I was glad to be off the hills. 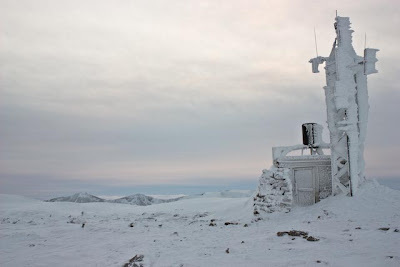 Photo info: The outer edge of the big storm approaching the Cairngorm Weather Station on the summit of Cairn Gorm. Canon EOS 450D, Canon EF-S 18-55mm IS@23mm f5.6@1/60, ISO 200, raw file converted to JPEG in Lightroom 2. 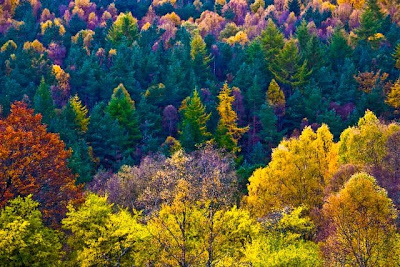 Reports suggest that the woodland colours this autumn are especially spectacular. I find them impressive every year and haven’t noticed any big difference in Strathspey, just the small changes that make each year interesting and unique. Wandering round the woods yesterday I noticed that the aspens, often flashes of brilliant yellow, have already lost their leaves and stand grey and bare, stark winter trees. Last week their foliage was still green so any colour has been brief. Bird cherries, which can be a brilliant red, have lost many leaves too and aren’t as glorious as in many years. In contrast the larches are only just beginning to turn, their needles fading from dark to pale green and showing just the first hints of yellow, their magnificent peak still to come. Rowans, which in some years show little colour other than the red berries and lose their leaves quickly, are turning a deep bronze red, that looks rather like dirty rust close to but stands out as a burst of intense colour at a distance. The real beauty lies with the birches though, which glow bright yellow and gold, though the strong winds of recent days have stripped leaves from the most exposed trees and branches, leaving them bare and with the purple tinge that marks them out in winter. Whilst many individual trees are worth stopping to contemplate and admire I find a big sweep of woodland with a mix of the dark green of conifers and the dazzling autumn colours of the deciduous trees the most striking and inspiring. At this time of year the forest, which has been a mass of uniform dull green for months, comes alive and shines in the landscape. Beyond and above the trees snow lay on the slopes of the high Cairngorms and the sky was swept with fast-moving squalls of cold rain and sleet. The forest was the place to be. Photo info: Strathspey Woodland. Canon EOS 450D, Canon EF-S 55-250mm IS@109mm, f5.6@1/60, ISO 200, raw file converted to JPEG in Lightroom 2. The weather forecast said sunny, the midge forecast said negligible so I headed to the Isle of Skye for a few days wild camping and gabbro scrambling. The midges on Skye can be ferocious so it’s somewhere I usually avoid during summer. By late September they are usually calming down and I had that midge forecast to reassure me. Even so I packed repellent and mosquito coils. Arriving in early evening I walked down Glen Sligachan as the sky darkened on a clear evening with just a faint hint of chill in the air and not a murmur of wind. Entry into the wild was between the towering sentinels of Sgurr na Gillean and Marsco, two of the magnificent mountains of Skye. As the light faded the stars started to shine and soon I was walking under a spectacular sky, another sign of the coming autumn. There are no skies like this in summer; the sky never darkens enough for the Milky Way to stand out so brightly. Revelling in the dramatic night with the stars sparkling between the black silhouettes of the hills I walked without a light, just able to follow the faint, pale line of the thin, twisting path. I did need a headlamp to stumble through the bogs to the narrow strip of dry ground beside Loch na Creitheach where I camped for two nights. The next day dawned grey and flat with no sign of the sun. The thick bank of cloud was just brushing the summits. I wandered up little Sgurr na Stri, one of the finest viewpoints in the whole of the Highlands, and stared down to Loch Scavaig and Loch Coruisk and up to the curving ramparts of the Cuillin, a familiar but always exciting ragged line of rock peaks. Tour boats from Elgol puttered around the head of Loch Scavaig. A kayaker paddled to an island on Loch Coruisk. The air was calm and everything was peaceful. Staying above Loch Coruisk I made a way over the rough terrain of the Druim nan Ramh, the going hard as the rock strata cut across the line of the ridge, making for many little ascents and descents. Right in the heart of the Cuillin Druim nan Ramh is another superb viewpoint, though little visited it seems as there’s no path. The mountains hung grey under the gloomy sky. 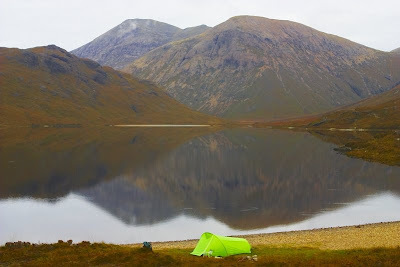 Back at camp I sat outside the tent contemplating the gently rippling waters of the loch and the huge mountains. 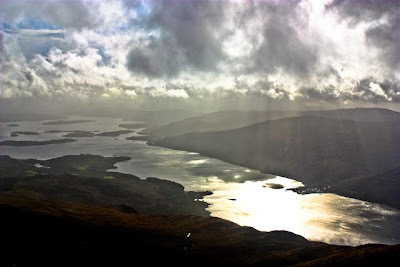 Skye is marvellous whatever the weather. Then the midges arrived. In numbers and hungry. 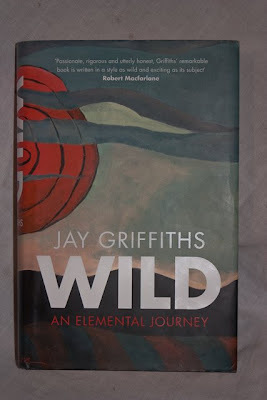 I cooked and ate in the tent with the doors zipped tight shut, glad it was midge proof, then read the evening away, unwilling to collect any more bites. The midge forecast could not have been less accurate. 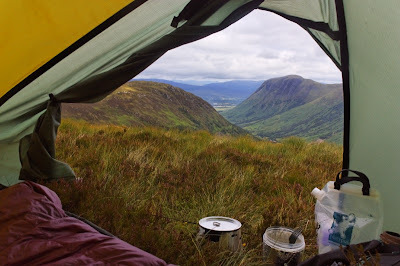 The midges were still waiting for me the next morning and the clouds were hiding the summits. I breakfasted in the tent then packed everything except the tent itself. Once outside I took the tent down, glad that this only took a few minutes, bundled into a pack pocket and headed back to Sligachan and the long drive home. The forecasts for sun and no midges were wrong but Skye had still worked its relaxing magic and I felt renewed and refreshed. Photo info: Canon EOS 450D, Canon EF-S 18-55mm IS@42mm, f8@1/160, ISO 200, raw file converted to JPEG in DxO Optics Pro. The nature of the light in the outdoors can make the difference between the mundane and the magical, the pleasant and the spectacular. Dull days with grey skies and flat light that takes away sharpness and clarity, reducing everything to an amorphous undefined mass, are often uninspiring and even dispiriting. Yet even on such days the light can change fast, transforming a scene from uninteresting to exciting. Such a day occurred last week. The weather forecast being for rain and cloud and the skies outside verifying this I headed for the local Hills of Cromdale rather than venturing further afield and plodded through the heather to the highest summit, Creagan a’Chaise. A cool wind swept the moorland and squalls of rain blasted in from the west, drenching the already saturated land. 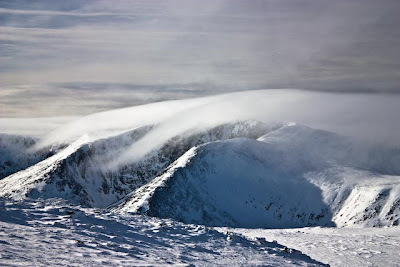 The high Cairngorms were hidden in dense cloud. I sheltered behind the big summit cairn for a snack and watched the rain storms blotting out the woods and fields below as they raced past. 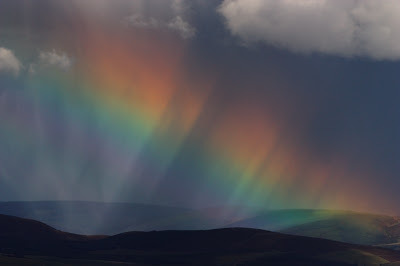 A rainbow curved over Strathspey then faded. Further away I caught a glimpse of colour beside the dark pointed peak of Ben Rinnes out towards the coast. 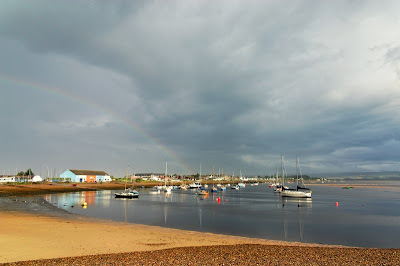 The colour grew into a smear of rainbow hanging in the air. From below rays of white bright light appeared to shoot upwards, illuminating the rainbow. These crepuscular rays, sometimes called god beams, are shafts of sunlight contrasting with air in shadow. No sun was visible though and the sky behind the light beams was dark. The effect was quite unreal and strange, especially given the general colourless and insipid light all around. Photographers often talk of photographing light rather than anything physical. Now whilst the right light is essential to a good photograph the subject matter is usually important too. In this case the light really was all and I isolated it with a telephoto lens to make the image above. 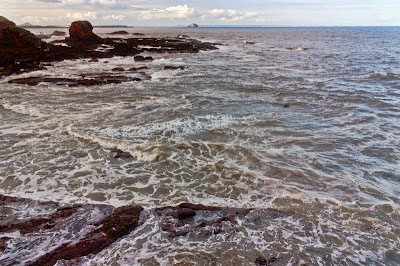 As the land round about was grey and lifeless images I took at a wider angle do not have the same impact. I used a polarising filter to bring out the colours of the rainbow (in shots without the polariser the rainbow is hardly visible so the polariser helped make the scene more like the one I actually saw) but did not do any post processing of the image. Photo info: Canon EOS 450D, Canon EF-S 55-250 mm @250mm, f8@1/640, ISO 400, polarising filter, raw file converted to JPEG in DxO Optics Pro. Last weekend saw the Annual Gathering of the Mountaineering Council of Scotland at Glenmore Lodge. Outside the rain teemed down and the mist brushed the tops of the forest. With the hills hidden and the air sodden being indoors wasn’t much of a chore. The AGM and other business over we came to the main attraction of the day – guest speaker Hugh Fullerton-Smith, general manager of the Alladale Estate (which has just had a great deal of free PR courtesy of a BBC series). 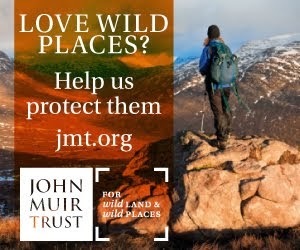 Owner Paul Lister wants to enclose the 23,000 acre estate with a high electrified fence and prevent access except for guided paying guests, something the Mountaineering Council is strongly opposed to (see the statement on the MCoS website). Hugh must have known that his audience was hardly likely to support these plans – his main defence of them seemed to be that they weren’t that likely to happen and that it might be a long time in the future if they did. After outlining his exciting and varied career before coming to Alladale Hugh talked about the work being done on the estate to restore the land, something with which the MCoS has no quarrel, and which does not require a fence or access restrictions. However Paul Lister would also like to reintroduce wild animals, including, ultimately, wolves and bears, and charge people to see them. At present he has small enclosures containing boar and elk. Questions and comments following Hugh’s talk made it clear that MCoS members’ opposition to the fence and any restrictions on access is deeply and fiercely felt. Hugh defended the current small fenced area, which does have stiles, though not as many as Highland Council would like (as a representative at the meeting made clear), on the ground that it housed a scientific experiment but with regard to the much bigger proposed fence could only say that Paul Lister wanted it for his Alladale Wilderness Reserve. This suggests that its only purpose would be to restrict access. Indeed, Hugh said that fencing the whole 23,000 acres would not be possible due to some of the high terrain and that only fencing 14,000 acres was feasible. As he also said that 23,000 acres was not big enough for wolves and bears what reason other than restricting access could there be for fencing 14,000 acres? My hope is that Hugh has taken back to Paul Lister the message that the MCoS is implacably opposed to the fence and will determinedly fight it if a planning application ever materialises. 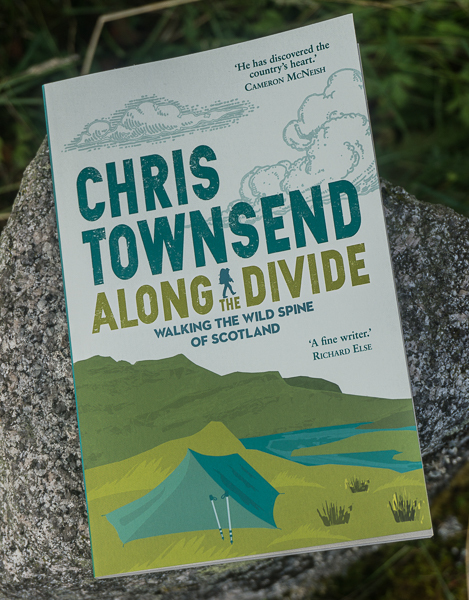 There’s an excellent account of the talk and discussion on the Walk Highlands website. My previous blogs about Alladale were on August 15, September 16 and November 7 2007. 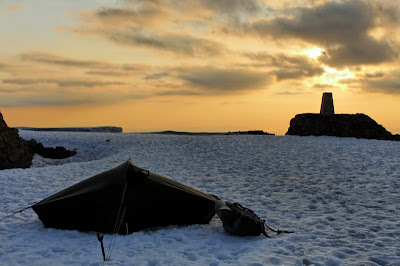 The photo shows a camp on the hills above Alladale. Photo info: Canon EOS 350D, Canon EF-S 18-55 mm @18mm, f8@1/320, ISO 200, raw file converted to JPEG in DxO Optics Pro. Over on The Outdoor Station site Bob and Rose Cartwright have put together six interesting podcasts on this years Friedrichshafen OutDoor show that are well worth listening to by anyone interested in new outdoor gear. Included in the fifth podcast is a short interview with John Manning and me, made when we met Bob in one of the big "Tent City" halls. I admire Bob and Rose's stamina in putting these podcasts together. It's hard enough work just prowling the stands and talking to people without recording them as well. The photo shows Terra Nova's new tarp with netting inner. The photo shows Terra Nova's new tarp with netting inner. Photo info: Canon EOS 450D, Canon EF-S 18-55 mm IS@18 mm, f3.5@1/60, ISO 200, raw file converted to JPEG in DxO Optics Pro. Last week I spent four days tramping the giant aircraft hangar-like exhibition halls in Friedrichshafen in Southern Germany looking at outdoor gear, old and new. It’s a strange activity, spending all day inside in noisy, echoing, crowded halls under glaring artificial lights examining products designed to take you away from just such places. On previous visits to the show the weather had been hot and sunny, which made the exhibition halls unpleasantly warm and sticky. This year the weather was cooler and wetter with frequent downpours and one spectacular thunderstorm, which at least meant the halls were cooler. Relief from the unnatural environs of the show was provided by the footwear company Merrell who for the second year running set up a tipi village in a meadow surrounded by woodland just ten minutes walk but a million miles in feel from the exhibition. The tipi village was a great place to unwind after the show and talk to writers from other magazines and other outdoors people. 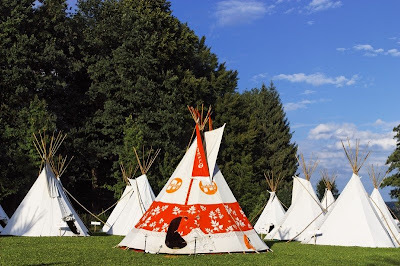 Last year the tipis were fitted with rather unstable camp beds. This year Aerobeds were provided, which I found the most comfortable camping mattress I’ve ever used. You wouldn’t want to carry an Aerobed far though (and it wouldn’t fit in an Akto!). The tipis are wonderful to sleep in, even if they did prove less than fully waterproof in torrential rain. What though of the gear on show? With over 800 exhibitors there was much to see, not all of it very interesting. Here’s a quick run-through of some of the items that attracted my attention. In packs there’s some good looking lightweight models from Lightwave – the 55/60 litre Wildtrek – and Osprey - the 46/58 litre Exos. Elsewhere there were a surprising number of similar packs with long water resistant front zips. In shelters Integral Designs has a curious winter bivy bag called the Penguin Reflexion, which is made from a heat reflecting silver reflective version of Sympatex, and a tarp with a single hoop called the SilDome that begs the question as to what is a tarp. To me the SilDome looks like a tent flysheet. Terra Nova also has a shaped tarp that comes with an insect netting inner. This pitches with trekking poles and looks a bit more like a tarp than the SilDome. In tents the emphasis seems to be on large and light with Terra Nova showing a 2.7kg tent in which I can practically stand up and The North Face a roomy tent with almost vertical inner walls called the Minibus 23. 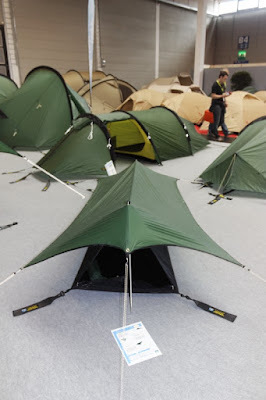 MSR had some light tents with carbon fibre poles called the Carbon Reflex that look interesting too. The luxuriousness of the Aerobed may not be portable but there were some comfortable-looking inflatable mattresses that you can carry in a pack. Cascade Designs showed an airbed called the Neo Air with a reflective barrier inside and an internal structure claimed to overcome the problem of cold air circulating. At 260 grams in the small size the Neo Air could be the most comfortable backpacker’s mattress yet if it really is warm. Alternatively there is Pacific Outdoor Equipment’s Peak Oyl Lite (so called because it’s made from palm oil rather than petroleum) which is said to be the lightest 1 inch thick self-inflating mat. The 2/3 length one weighs 360 grams. An unusual device – it can’t be called a stove – is the Heatgear Heatstick, a gas-powered water heater that fits inside a water bottle. It’s not light – 329 grams for the 0.5 litre version including bottle – but there’s no flame and it’s said to work in any temperature. Maybe a replacement for a vacuum flask? More conventional lightweight stoves come from Primus, with the 596 gram remote canister EtaPacklite complete with heat exchanger, windscreen and 1.2 litre pot, and Snow Peak with the 56 gram Lite Max, the lightest canister stove yet. In clothing Rab has a new eVent jacket, the Momentum, at a light 340 grams, while Marmot had a very light Paclite jacket, the Nano at 228 grams. Not exceptionally light at 482 grams Patagonia’s Stretch Ascent N2NO jacket is interesting because it’s made from 100% recycled polyester. There was much else of interest of course but these are a few of the highlights. Along with other items detailed test reports will appear by me and others in TGO magazine and on the Backpacking Light.com website over the next year. Wet and windy, cool and cloudy. The northerly wind mocked t-shirts and shorts, the clouds lay low on the hills, sometimes brushing the tops of the highest forests. A time for deskwork and reading. And for scanning the weather forecast, watching for a hint, a sign, a suggestion of a clearance. There it was. “A brief ridge of high pressure”, clearer in the west than the east and probably lasting less than 24 hours before the wet clouds sank down on the hills again. So west I went, departure almost delayed by the final collapse of my old car (107,000 miles on the clock) and the necessity for a hasty replacement, hopefully more economic to run. With a new old car (only 60,700 miles on the clock) I drove through continuing heavy showers below invisible hills. Just how brief was this high pressure going to be? By Glen Nevis the rain had stopped and the wind had faded away. I stopped at the Visitor Centre. Someone was cooking over a large double burner. My eyes were drawn to the midge net covering their head and face. I didn’t get out of the car but continued up the glen to a quieter car park, though no less midge ridden. As evening walks often mean midges I was ready to leap out of the car, grab my pack and head off, little preparation needed. Within minutes I was climbing a rough footpath on the edge of the woods a little out of breath but free of the midges. Soon a big ladder stile led out of the forest and into the wide mouth of a deep corrie. I had thought of camping here but there was no wind and the ground was boggy. I didn’t wait to see if there were midges, certain there would be, but climbed out of the corrie onto a broad ridge. A breeze rippled the grasses. No midges. Further up the ridge a flattish area beside a big boulder looked a good camp site. I lay down. Yes, I thought, I can sleep comfortably here. I pitched the tent then headed downhill in search of water. After ten minutes I heard trickling and soon found a streamlet big enough to fill my bottles. 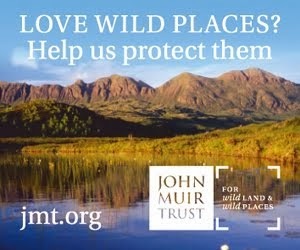 I’d much rather camp where it’s midge-free and walk to water than have water and midges to hand. The evening was slow and pale as the light gently faded through shades of grey. Lower hills were cloud free, higher ones enshrouded. In the early hours of dawn I woke and looked out. The returning light was still dull with no hint of the sun. I slept a few more hours. The clouds were slowly lifting though and by mid morning only Ben Nevis was still hidden, as it was to remain all day. My peaceful and relaxing camp soon packed away I continued up the ridge to the summit of Mullach nan Coirean from where I could look east along the Mamores ridge, which is probably the finest on the Scottish mainland. Including its many spurs there are twenty summits, ten of them Munros, strewn along its twisting scalloped length. The traverse of them all is a superb one or two day trip, which I have done several times. Today just the western two Munros would suffice. 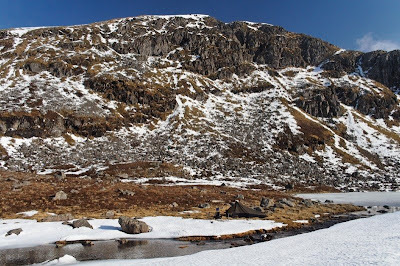 From the red disintegrating granite of Mullach nan Coirean I wandered over two minor tops to the silver-grey quartzite of Stob Ban before descending splendid Coire a’Mhusgain with its deep stream gorge and scattered old birch and rowan wood. The clouds were thickening as I reached the car and the first rain drops fell as I drove back down Glen Nevis, just twenty hours after I’d arrived, twenty hours of freedom, restoration, peace and beauty. View from the tent. Photo info: Canon EOS 450D, Canon EF-S 18-55 mm IS@ 18mm, f8@1/200, ISO 200, raw file converted to JPEG in DxO Optics Pro. How sentimental or affectionate should one be for old possessions? How much is invested in these physical links with events and adventures, times and places? How significant are the memories they hold? Over the years I’ve accumulated a collection of cameras, going right back to manual film SLRs and classic film compacts like the Olympus XA. There are cameras that travelled the length of the Canadian Rockies, through the Yukon Territory, along the Arizona Trail, to Everest Base Camp and on many more trips. In boxes of slide sleeves and now on hard discs I have the thousands of images taken with them, which are often referred to for articles, books and talks. The cameras themselves have been lying forgotten in old dusty camera bags in corners of my office, occasionally moved when in the way but mostly ignored. A decision to buy a new camera made me think about these old ones. Did I really need to keep them? Wouldn’t it better if they were with someone who would actually take pictures with them? I was considering selling those that still worked – not that there was much monetary value left in them – when my partner Denise mentioned that Hazel, my stepdaughter, had a friend at art college studying photography who might be interested in some cameras. 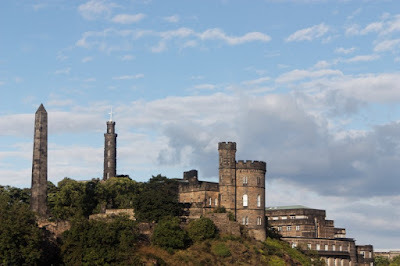 As we were going down to Edinburgh to visit Hazel soon anyway I emailed her friend, who showed great excitement at the thought of the cameras so I took them all down with me, filling half a big rucksack with bodies, lenses, boxes, cases and accessories. We commandeered the back room of the excellent Scott’s Deli and after lunch I laid out my old gear on a long table. How does this one work? I fiddled with the buttons and levers. Like this, I think. Or maybe not. Can you get this lens on this body? Um, probably. I think it goes this way. Oh, it’s the other way. I may have used these cameras hundreds of times in the past but I could no longer remember exactly how they worked. Watching Claudine handle them with excitement, her eyes lighting up as she looked through viewfinders, zoomed lenses and played with the controls, I realised that these old cameras still had much to offer and that it really was a waste to keep them lying round as barely remembered souvenirs. So they stayed in Edinburgh where I hope they will take many more photographs. And I returned home to all the photographs I took with them and to my new camera, which I am still learning to use. A table of camera gear in Scott’s Deli. Photo info: Ricoh GR-D, flash, program mode f2.4@1/30, ISO 100, raw file converted to JPEG in Adobe Camera Raw then cropped in Photoshop Elements 5. Film director Werner Herzog likes strange people, from Klaus Kinski to Timothy Treadwell, and remote wild places, from the Amazon rain forest (Fitzcarraldo) to the Alaskan wilderness (Grizzly Man). And now, perhaps inevitably, he has made a film about the remotest, wildest place of all, Antarctica, and the strange, driven people who gravitate there. Lured south by images of the weird beauty of the ice and the southern ocean Herzog finds a land where dreamers and adventurers, eccentrics and scientists live huddled together in ugly industrial shanty towns amidst unbelievable natural grandeur. In Encounters at the End of the World Herzog explores the land and the people and his own reactions to it. Some of his findings are humorous, some disquieting, some tragic and he switches abruptly between these, keeping the viewer unsure of what is to come and sometimes thrown off balance, stifling a laugh as the tragic nature of an event is suddenly apparent. This makes for an engrossing, fascinating documentary unlike anything else I have seen or read about Antarctica. The landscape looks as vast and magnificent as ever and is beautifully filmed, especially some underwater sequences following the edge of an ice sheet as it meets the ocean, an unreal, dream-like world. But it’s the people who are most memorable. Philosophers working as fork lift truck drivers, scientists rocking out on top of their hut with discordant electric guitars to celebrate a new discovery, a group of people about to go out onto the ice discovering what a white-out is like by trying to find someone while wearing white buckets on their heads, a scientist showing B movie science fiction films to his team. Herzog looks for the quirky and unusual, the disturbing and the disturbed, and finds it everywhere. The characters he interviews – or rather allows to talk – come across as powerful, committed, larger than life. The director has a trick of holding the camera on their faces before they start or after they finish speaking longer than expected, sometimes revealing powerful emotions. Even the wildlife comes across as unusual. “Are there gay penguins?” Herzog asks a reclusive scientist who has spent years studying them and perhaps prefers their company to that of humans. “Do penguins commit suicide?” The film shows penguins heading for the ocean. 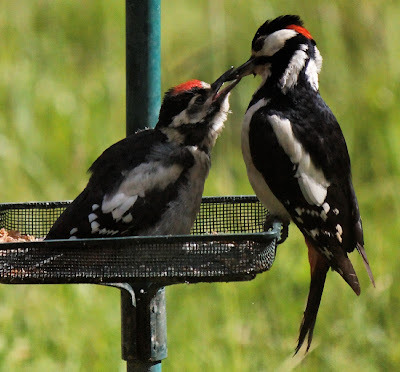 One dithers then turns and heads inland, away from any food. “It will die”, says the scientist. Herzog has his answer. I saw this excellent film at the Edinburgh International Film Festival, the only film I saw there this year. The performance was sold out. Unsurprisingly the film won Best Documentary at the Festival. 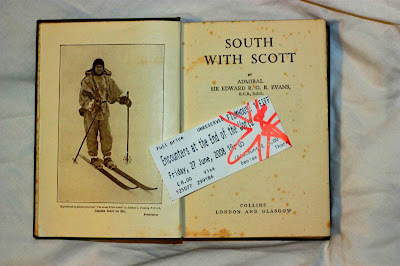 The book in the image was published in 1921 and picked up in a second-hand book shop many years ago. Photo info: Canon EOS 450D, Canon EF 50mm F1.8, flash, program mode, f3.5@1/60, ISO 400, raw file converted to JPEG in DxO Optics Pro. 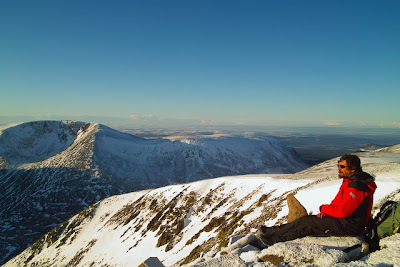 When planning my TGO Challenge walk across the Highlands I never thought of camping on the summit of Ben Nevis. That idea only began to take shape after the walk began and I watched the Ben from the hills to the west, a huge snow-capped dome shimmering in the sunshine. It was the snow that caught my attention. In summer the summit plateau of the Ben is a mass of boulders and stones with no flat ground for a camp and no water. There is a small emergency shelter perched on the remnants of the observatory built back in the 1880s but it’s dark, damp and dirty and not somewhere I ever want to spend the night. Bivvying on the rocks has never been appealing either. But you can pitch a tent on snow and it makes a comfortable bed. You can melt it too so I wouldn’t have to carry water. As I approached Fort William at the base of the mountain and the fine weather held the attractions of a night on the summit grew. Climbing the mountain late in the day as it grew cooler seemed wise as well. Thirteen hundred metres of steep rocky paths without shade and with a pack loaded up with food for the next five days would feel more comfortable then. With a late start in mind I spent most of a hot day in Fort William replenishing supplies – dried fruit, nuts and grain bars from a Julian Graves natural food shop, Crosse & Blackwell Pasta Sauce meals and a tube of Chilli Puree from Morrisons supermarket, “Murder in the Glen”, a novel by mountain rescue expert Hamish MacInnes, from the Nevisport outdoor shop. 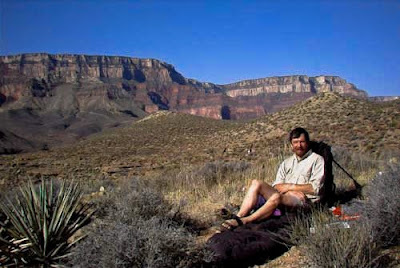 My feet having overheated on previous days even in thin socks and lightweight trail shoes I searched out a pair of budget walking sandals – Hi-Tec Tahoma – in a shoe shop and tried not to think of all the sandals I had back home. The Nevisport café and the Café Beag in Glen Nevis provided sustenance before I finally started up the mountain at 4 p.m. The sun was still high and hot as I started up the stony path. Although long and unrelenting it was the easiest ascent of the walk so far as the six hills I had already climbed had been boggy and pathless. Dozens of people passed me on the way down, many asking if I was camping out and telling me there was snow on top. They looked surprised when I replied “good”! This, the standard and easiest way up the mountain, isn’t the most exciting but there are good views of the Mamores on the far side of Ben Nevis. Eventually the angle of the stones started to ease and patches of snow appeared as I reached the now deserted summit plateau. All was calm, most unusual on this normally stormy and windswept mountain. I pitched the tent not far from the summit trig point. The snow was deep and soft – there was a ten foot thick drift around the old observatory. Lacking snow stakes I stamped my thin pegs in hard and used my trekking poles to anchor the main guylines. 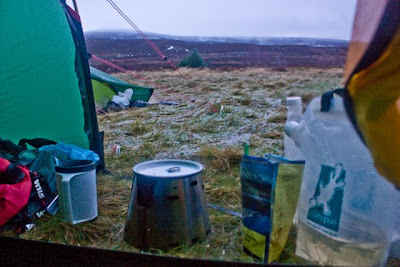 There was no need to shelter in the tent though and I sat outside with my little stove purring away insulated from the snow on a flat stone. A snow bunting was singing by the summit cairn and a raven wheeled overhead. Dinner over I wandered along the edge of the great cliffs of the north face, staring down the snowy gullies and massive rock faces. A strange swishing noise came up from the depths. Staring down I spotted two climbers far below shovelling snow off a ledge on Tower Ridge. Later I saw them heading down into Coire Leis. Apart from these distant figures I was alone; watching as the sun slowly descended through thin clouds, turning them a gentle pink. As darkness grew a half moon rose into the black sky and stars appeared. All was silent. No wind. No running water. I shivered with delight and amazement at being up here in perfect conditions. The night was chilly but the temperature in the tent didn’t quite reach freezing. I woke to a wet mist and a gusty east wind. The humidity made everything damp and the world was grey but I could see a pale sun through the clouds and occasionally there was a clearance and a patch of blue appeared. Soon the mist shrank back from the summit, filling the glens but leaving me in bright sunshine. I wandered round the summit again, reluctant to leave, but the walk had to continue and the warm rocks and graceful curve of the Carn Mor Dearg Arête beckoned. I had had the summit of Ben Nevis to myself for 14 hours. I could ask no more. 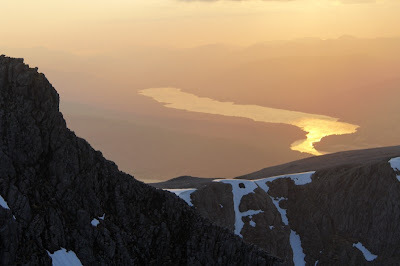 Evening on Ben Nevis. Photo info: Canon EOS 350D, Canon EF-S 18-55 mm IS@ 25mm, f8@1/500, ISO 100, raw file converted to JPEG in DxO Optics Pro.